Tracheal nerve is a somatic efferent nerve which have a connection with a single muscle. It is also known as cranial nerve 4 or fourth cranial nerve. It is a motor nerve. It has a connection with the superior oblique muscle of eye and this get operated via pulley like trochlea. Trochlea is a Latin word mean pulley. 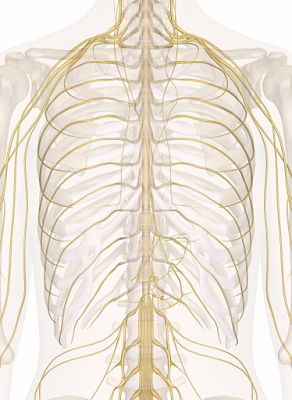 It is a unique nerve as it contains smaller no. of axons in it. The intracranial length of trochlear nerve is the greatest. This is the only nerve which exits from the rear side of the brainstem. It is found in all vertebrates with jaws. It is also found in the brain of shark in its collateral innervation. Trochlear nerve is originated from the embryonic midbrain at the basal plate. As it has a connection with superior oblique muscle, so this muscle end up in the tendon passing from a fibrous loop. This fibrous loop is trochlea, the superior oblique muscle body lies behind the eyeball position, but the tendon to which it connects is at the front side of eyeball. This tendon get attached to the eye at primary position. This superior oblique muscle is responsible for eye ball movement. There are three main nerves involved in the movement of eye are oculomotor nerve, trochlear nerve and abducent nerve. So the test performed are according to nerves involved. Visual pursuit test is performed primarily in which the patient with a still head have to move his eyes along with the finger or pen moving right in front of him by the physician. Then the patient is allowed to look towards his nose and move the eyeball. The physician can also check the trochlear nerve by the help of a torch looking into the eye and the contraction is observed. Fundoscopy is also done. The trochlear nerve originates from the basal plate of the embryonic midbrain i.e. the dorsal side of brain stem. It anteriorly circle around the brain stem and then run forward to the subarachnoid space containing eye. It get connected with the muscle named superior oblique muscle and this muscle in turn attached to a tendon. This tendon is responsible for the movement of eye. The main body of the superior oblique muscle lie behind the eye but the tendon supports the eyeball from front side named primary position of the eye. The trochlear nerve have the greatest course of cranium and exits dorsally. The trochlear nerve palsy is seen rarely but a main cause behind binocular vertical oblique diplopia is isolation. It is also known as fourth nerve palsy and it can be congenital or may be acquired later in life due to a head trauma. It has two types i.e. unilateral and bilateral. This can be occurred due to the weakness in the superior oblique muscle connection or many other genetical problems by birth. In order to treat trochlear nerve palsy, a surgical method is required.